Not many rivers hold Grayling and probably the Welsh Dee has the largest grayling per area of any river in the UK the world championship was held here 3 years ago. The course is designed for beginners and experienced anglers and is mainly, on the river bank course with a few hours classroom. But whatever the need anyone will benefit from learning and fishing for the’ lady of the stream’ subject to weather & prevailing conditions. » Meet your instructor who has fished for grayling or 15 years. » Tackling up and fly selection wet, nymph and dry. » Making up a team and leader. Knots x 4 useful ones to have. » A balanced outfit and general tackle talk. 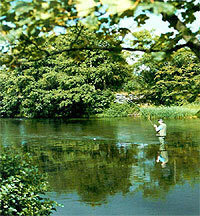 Casting to Grayling down river. » You may fish the river until dusk. » Video the fourth game fish actually filmed on the Dee. 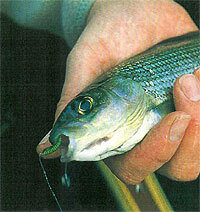 » Fishing for Grayling and on river casting tuition coping with awkward and difficult conditions. » You may fish until Dusk on the River. » Fishing on river continues. » course over disperse or you may carry on fishing. Includes all water tickets @ £7-10.00 and all equipment supplied. Discount given for group bookings. Please see our booking page for details of how to reserve your place, or call me on 0702 111 4746 to discuss your particular needs.